The Dominican Republic is an island in the Caribbean that has a rich and unique history starting with the Indigenous Taino People, The Spanish Conquest, Haitian Rule to the present time. Before the Europeans arrived on the island of Hispaniola and claimed they were the so-called “discoverers” of the entire island, it was occupied by the Taino Indians. The Tainos lived on the island they lovingly called Quisqueya. 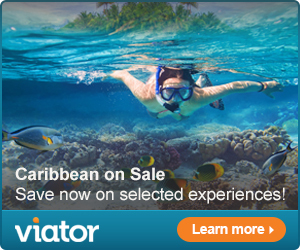 In the Taino language this means “Land for which there is none better”. The peaceful Tainos (they did war with neighboring tribes such as the blood thirsty Caribs) almost entire demise coincided with the arrival of the Spaniards and their abuse of these original inhabitants of this small island. These “savages”, as the Europeans thought of them, who had ruled the island, now lost their way of life and eventually most lost their lives because of this invasion of the Whites. 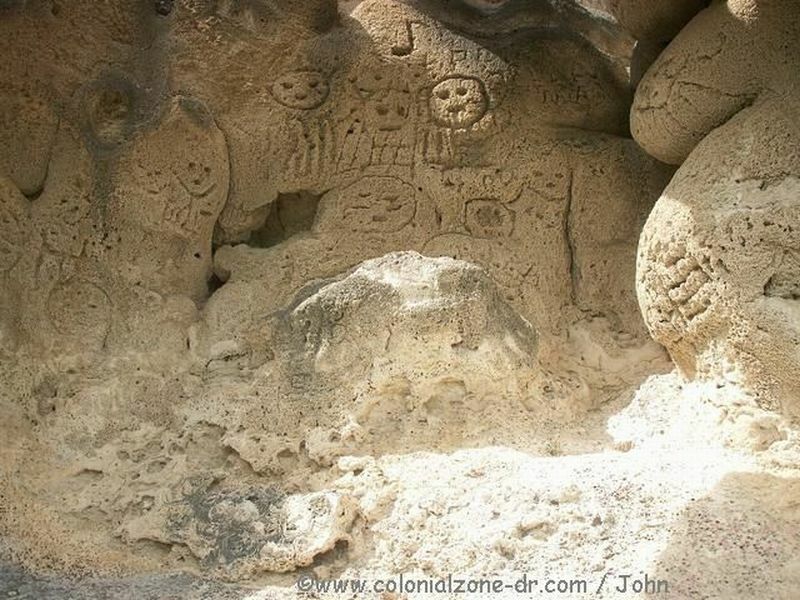 The Taino nation was doomed the moment Christopher Columbus landed. 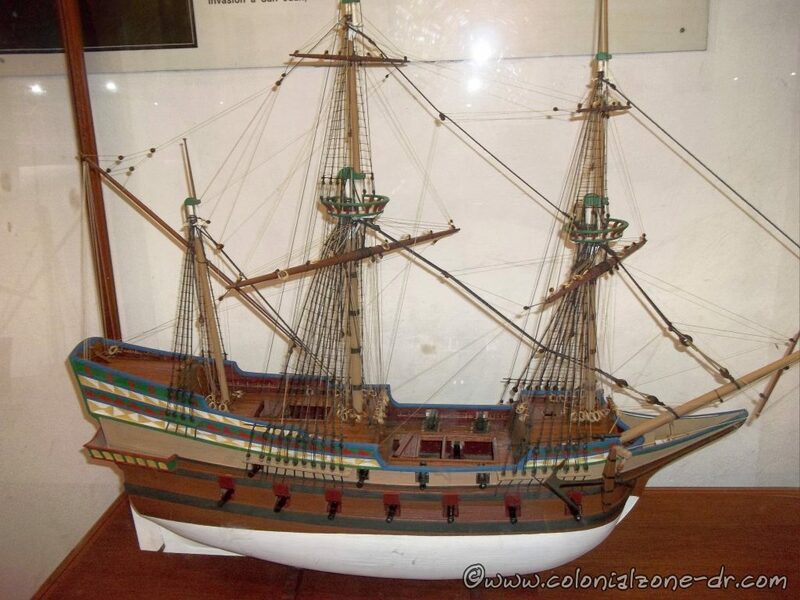 Replica of one of the ships Columbus arrived in. Christopher Columbus, in Spanish Cristóbal Colón, to the island on the ship La Santa María. There were two other ships that accompanied him, La Pinta and La Niña. 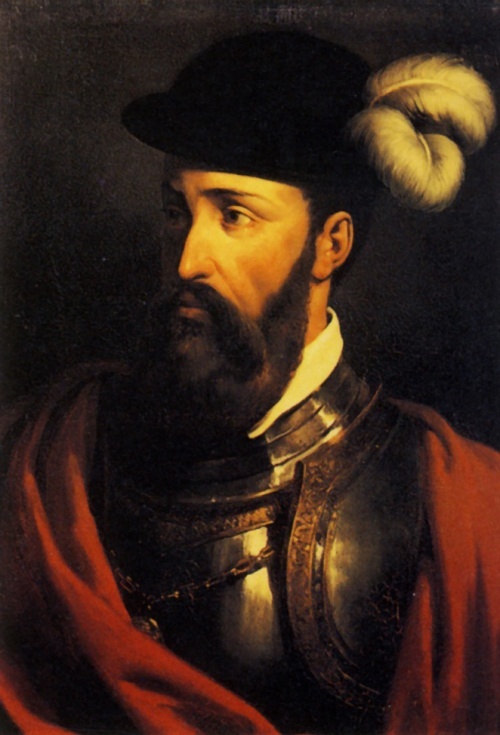 He found the island first on October 12, 1492. Columbus first landed on one of the islands in the Bahamas. Later that year also found Cuba and an island he called La Isla Espanola (he was on the western side of the island). When Columbus returned to Spain he left some of his men behind to look for the gold he thought was on the island. 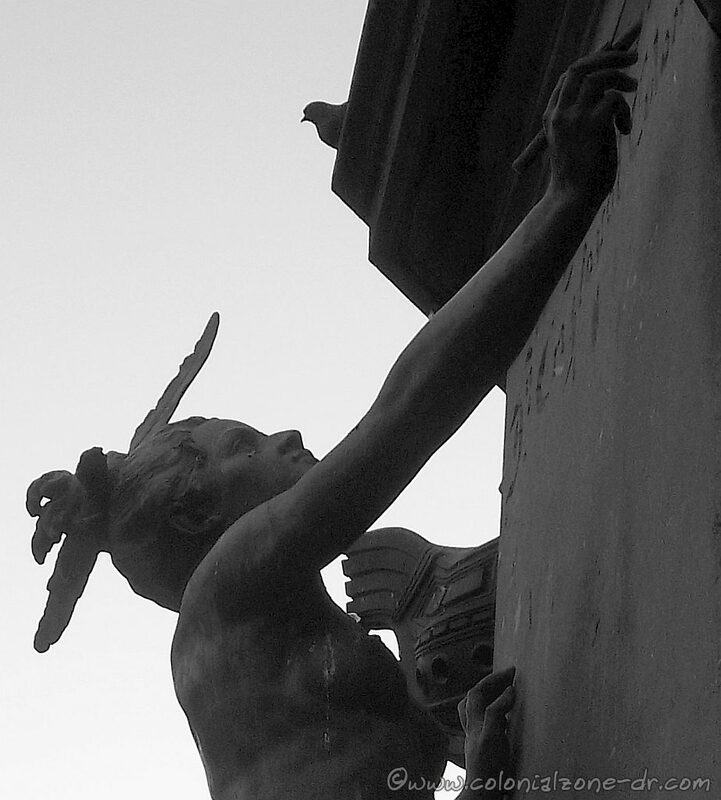 When Columbus made his second voyage, he returned to find most of the people he left on Hispaniola had vanished. Dead. His fleet of 17 ships continued traveling along the coast toward the east. Finally, stopping to create a fortified post, Christopher left his brother and some men who were to search inward for the promised gold. Columbus traveled continued his quest searching elsewhere for the gold he promised the Queen. By the spring of 1494 the island Hispaniola was colonized. The island Columbus declared to be “the most beautiful island the human eyes have ever seen” is where he wanted his remains entered to rest forever. The first Europeans settled in 1496. 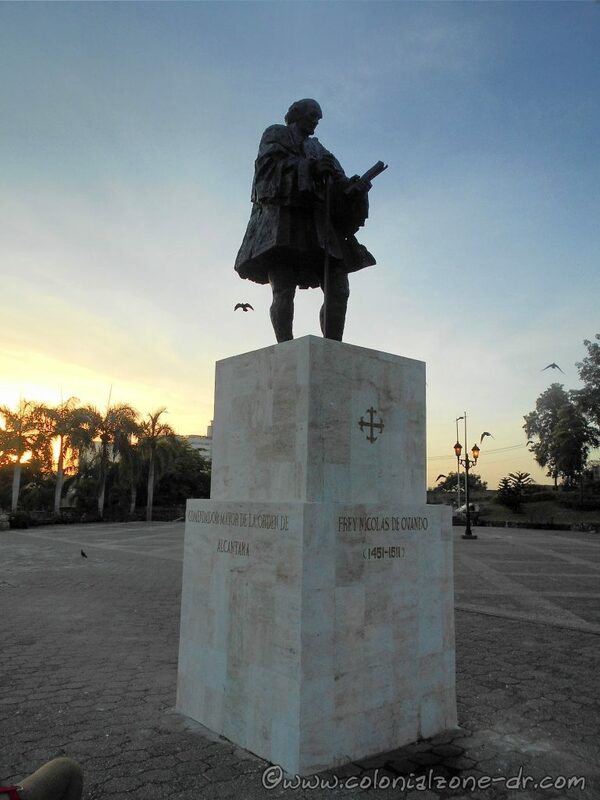 The brother of Christopher, Bartholomew Columbus founded Santo Domingo, the capital of the Dominican Republic, officially on August 5, 1498. 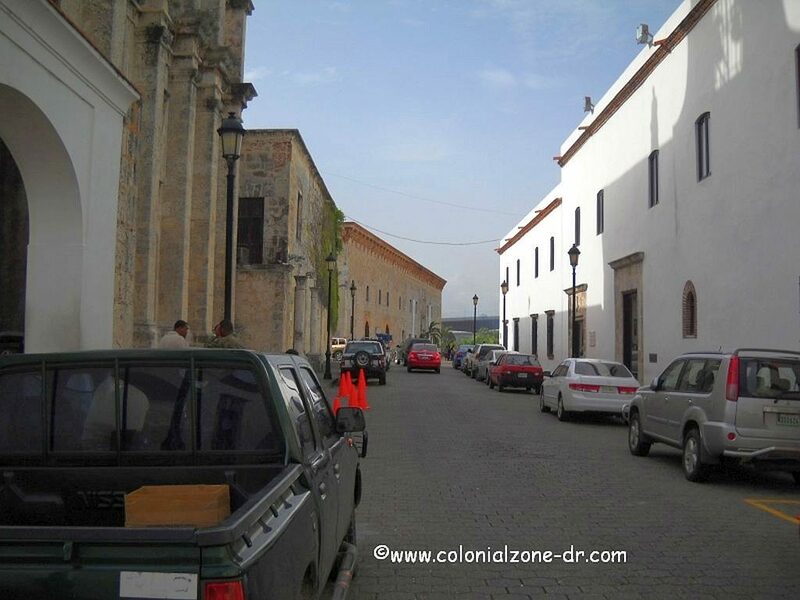 The city, originally named La Isabela, is the oldest European city founded by Europeans in the “New World”. 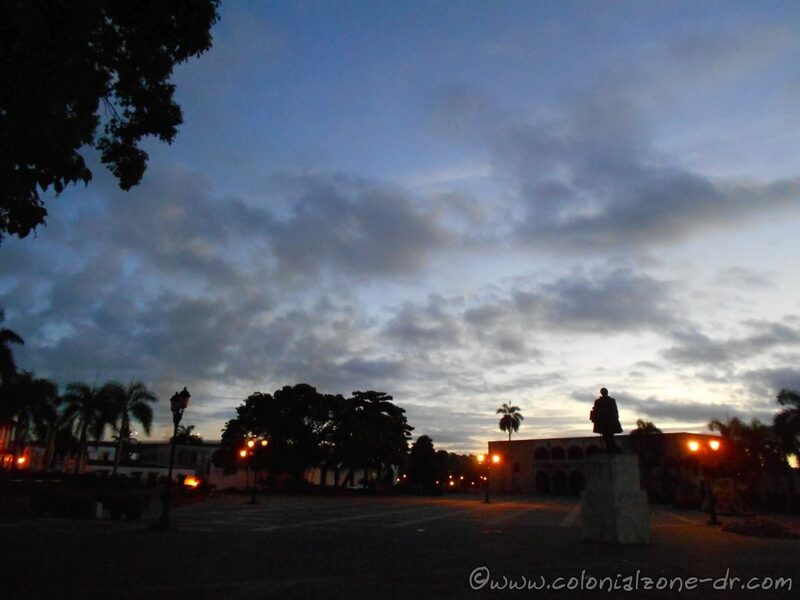 It is the oldest colonial city in all the Americas. Santo Domingo was the place of origin for much of the exploration and conquest of the New World throughout its first century of existence. The “discovery” of Puerto Rico by Ponce de Leon, the conquest of Mexico by Cortez, and the first sighting of the Pacific Ocean by Balboa, all started here in Santo Domingo. The famous pirate Francis Drake invaded in 1568 and weakened the Spanish domain over Hispaniola (or Hispaniola) in 1568. The Spaniards abandoned the city and it was left to Drake and the pirates for more than 50 years. 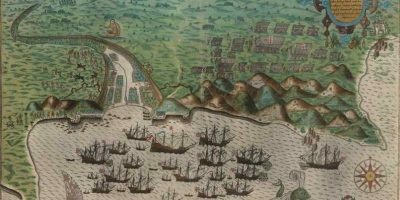 It remained this way until the French invaded the west side of the island in 1655. After many treaties and forced annexations the part of the island originally called by Santo Domingo was less than half it’s original size. Commanded by Toussaint Louverture, the Haitians took over the island in 1822. They ruled the island for 22 years, fighting for their lost independence. The Spaniards again became independent of Haitian rule on February 27, 1844. Thanks to their leaders Juan Pablo Duarte, Francisco del Rosario Sánchez and Ramón Matías Mella. This was when the Spanish part of the island became known as the Dominican Republic. The Haitian’s were totally defeated in 1861 and sent to their own side of the island. The struggle to keep control the country even after Spanish independence was gained was on going. In 1916 The United States of America, wanting to have more power and influence in the Dominican Republic, used World War 1 as an excuse to bring in the Marines. They came to “protect” the country against the “bad” European powers. The USA changed the infrastructure to best benefit them. Dominican Republic had its first, somewhat, free elections in 1924 which put Rafael Leonidas Trujillo in power. The US finally decided to leave the Dominican Republic to itself and left. Soon Trujillo was able to gain power and in 1930 he took over completely. 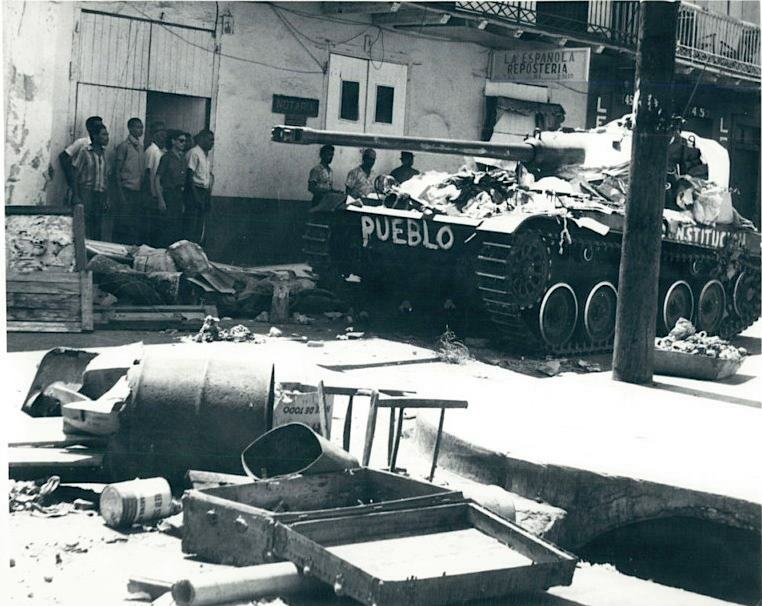 The Trujillo dictatorship ended on May 30, 1961 with his execution by ambush. He died one of the richest men in the world. After this there were many political and economic problems. The US Marines returned in 1965 to occupy the country because they said the uprising was the fault of the Communists. USA left when Dr. Joaquín Balaguer was elected president once again (many say the election was fixed). Through all these political struggles and civil wars the country becomes independent. 1992 marked the 500th anniversary, El Quinto Centenario, of Christopher Columbus’ opening of Las Americas to the colonization of the Europeans. The Columbus Lighthouse, Faro de Colón, with an approximate cost of 400 million Dominican pesos, was erected in honor of this occasion. This massive structure is in the shape of a cross and houses the remains (so it is said) of Christopher Columbus along with many other exhibits. This building is amazing to see by day and the spectacular lights form a cross in the heavens at night (the lights are only shown on special occasions because of the electricity problems) that can be seen for long distances. See many old pictures of Santo Domingo and Dominican Republic. Much of the original city can still be seen today. The cathedral, monastery, university and hospital are among many of the “firsts” that happened here. The 16th-century buildings, homes and churches where one can see the old world Spanish architectural styles of the period. Many are still in excellent condition and are a wonder to behold. 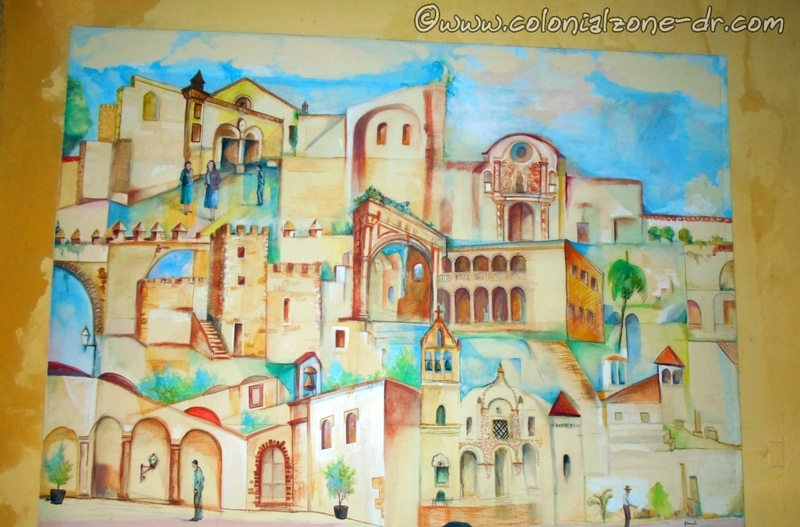 Colonial Zone (and the surrounding sectors including San Miguel, San Lázaro, Santa Barbara, San Anton, San Carlos, Atarazana, and Cuidad Nueva) is a wonderful mix of the past and present. The old and new intertwine to make a unique travelers experience. 4. First Mass officiated in the Americas: January 6, 1494. 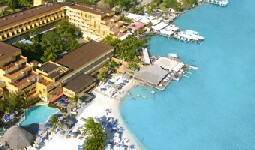 There are many cultural treasures located throughout Dominican Republic. In 2010 there was a vote by the held by the International Bureau of Capitals of Culture. 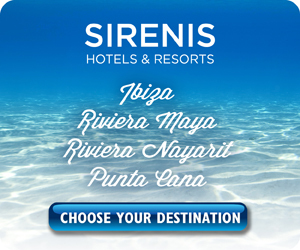 They help people to notice important cultural locations throughout the world. This year they focused on Dominican Republic. There were 27 candidates for the treasure, and most were in the Colonial Zone. They received 18,420 votes. This is a list of the places voted for and the number of votes received. You can find information about these locations in the Colonial Zone Sights section.